At The Staffing Alliance, we offer a wide variety of staffing services to fit your needs - whether you're a business seeking employees or an individual who is seeking employment. Take a look at some of the service areas below, and click on each to learn more. Whether you need temp-to-hire-service employees, skilled temporary employees, or trainable unskilled temporary employees, The Staffing Alliance can help. Our temporary worker hiring process and stringent training standards ensures that each of our workers possess a basic knowledge of safety in the workplace and are ready to perform specific tasks for any chosen job from day one. The Staffing Alliance offers qualified unskilled, skilled, and temp-to-hire employees for client companies in a variety of industries spanning the state of North Carolina. When you work with The Staffing Alliance, you can trust that you're getting the best individual for the job. Match required skill sets with applicants. 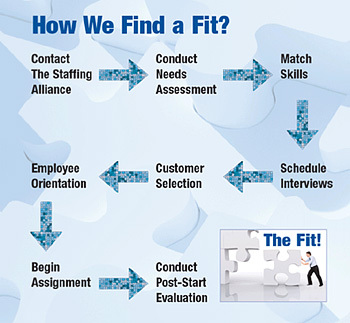 How We Find A Fit? All services include payroll taxes (federal and state), workers' compensation, and unemployment. Risk management to include safety orientation. Pay employees on weekly or bi-weekly basis.